When is a good moment to look for coaching while doing the MIR-Method? 4. If you are very sensitive and always respond strongly to treatments. First try it yourself by doing step 5 and 7 for two weeks. If you feel the process is too strong on you, please contact a therapist. Always remember that a therapist or coach can help you with using the MIR-Method. These people are trained by Mireille Mettes. They can find out in a consult where in the 9 steps are the biggest issues. They work with you in a very efficient way to clear out any blockages that may still be bothering you. 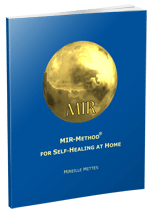 The result of these consults is that the whole process of the MIR-Method will be accelerated. Look below to find a suitable coach for you. Feel free to contact the coach by e-mail or phone. A session via Skype is also possible.